The main exhibition will be open for the evening. Pardeh-Khani is the art of narrating an Epic or religious stories such as the event of Karbala on the day of Ashura. Usually the Pardeh-Khan (the Narrator) uses a large curtain with paintings on it to recite the depicted stories. The style of painting in Pardeh-Khani performances goes back to the earliest examples of visual representations in Iranian history such as bas-reliefs in Persepolis (c. 500 B. C.); Later references can be seen in Persian Miniature Paintings. The paintings of Pardeh-Khani as well Persian Miniature are done in realistic style with a lot of figures and faces but no perspective. The deliberate lack of perspective enabled the painter to visualize different plots and sub-plots within the same 'one dimensional' set. The first „guest workers“, who came to Germany in the 1950s, mostly wore their best suits for their arrival. Daring, a willingness to take risks, and insecurity were visible in equal parts on their faces when friends from their old country took their photographs. The choice of „fitting“ clothes for the long trip is the point of departure for Moira Zoitl’s film Flight Strength. For it was no coincidence that the best suit was chosen for the long trip. Migration is a serious undertaking accompanied by ambivalent emotions: grief for the homeland left behind, worry about an uncertain future, anxious expectations, but also curiosity and adventurousness. With her film, Moira Zoitl creates a performance analogous to the personal transformational process experienced by someone who leaves his homeland behind for an uncertain foreign locale. In this intimate narrative, which takes as its premise the Little Ice Age at the end of the 18th century, the film Der Nebel extends the genre of found-footage-film to question its own clarity. 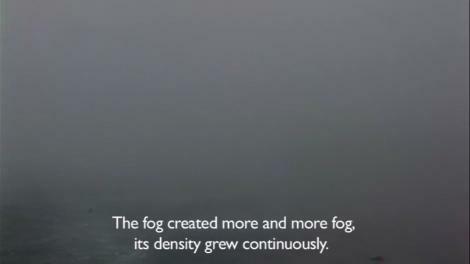 Examining the act of seeing as an act of transmission, the film merges footage from Youtube with an extended shot of a ferry ride through the fog. The fog, a metaphor for capitalism, remains ultimately opaque, revolving around obscure allusions to the world’s financial crash.